Steffen Hindelang, Jurgita Baur: Stocktaking of investment protection provisions in EU agreements and Member States’ bilateral investment treaties and their impact on the coherence of EU policy. Europäisches Parlament Study, 2019, ISBN: 978-92-846-4707-1. This short paper provides a general overview of existing investment protection provisions in selected EU agreements with third countries. 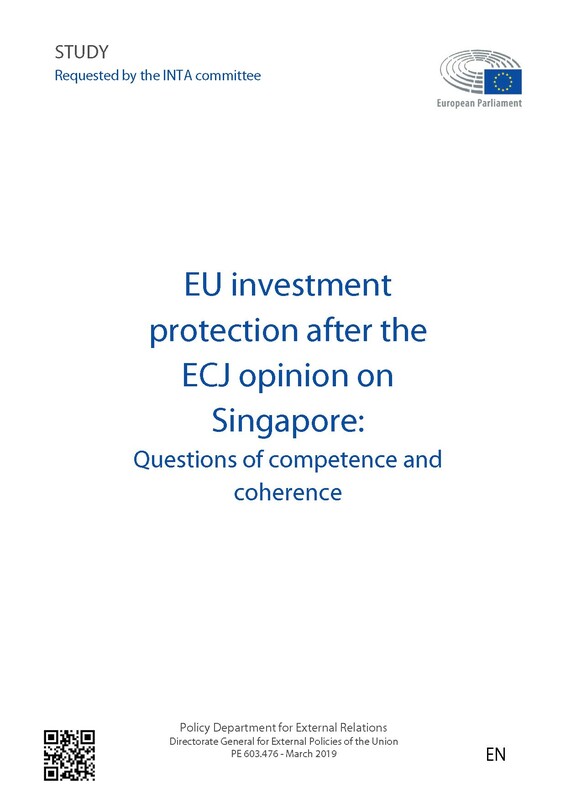 It assesses to what extent there is coherence between the different regimes and, as a consequence of the CJEU’s Opinion 2/15, how the splitting between FTAs and investment protection agreements impacts policy coherence. It also looks at selected existing bilateral investment treaties of EU Member States and assesses them from the point of view of consistency with EU policy and highlights certain challenges for the EU linked with the existence of the different investment protection provisions as of today.